Left to its own devices my hair would remind you of a cross between Russell Brand and Worzel Gummidge. Until a few months ago, when it has literally been transformed by a new range of products and a fancy device. My hair type is individually quite fine but there’s a lot of it. Underneath it’s quite coarse, wiry and darker in colour - typical redhead hair. It’s also curlier underneath and more frizz prone. The top layers are finer and silkier but still frizz prone, lighter in colour and wavy. I get a few surface highlights once or twice a year, which I can get away with as there are a lot of different tones in my natural hair colour (not been done for over a year as considering growing highlights out). I have tried a lot of premium hair products in the past and basically given up as I constantly felt let down by the results, so had resorted to anything I could pick up in the supermarket as nothing seemed to make much of an impact. Admittedly I expect a lot from hair products and very rarely use anything other than shampoo and conditioner. After spending a small fortune trying to find my holy grail styling products, I find that most weigh my hair down. I live in hope of finding a shampoo and conditioner that will do the job on their own – and now I have! The first time I used these products I was seriously excited as nothing had ever made such an impact on my hair. It was so soft and silky I honestly couldn’t believe it and several months on I’m still in love. It’s not cheap (around £15 per product), but my little travel sized bottles of the shampoo and conditioner are good value and still going strong as you only need the teeniest amount of product. I used the Moisture range and while I adore it and it’s really helped get my hair back in shape, it’s probably a bit rich for constant use, so I may try something else next time – and there will definitely be a next time! My second hair weapon is Babyliss Big Hair – a rotating ceramic hot styling brush. I will do a separate tutorial on how this works as I know some people find it quite tricky to get used to. I felt it only fair to mention it here as although UNITE products have improved the condition of my hair, I couldn’t get it to look like it does without the help of Babyliss Big Hair – it’s literally been a godsend! These usually cost around £45 but I got mine on special offer from Argos at £35 around 6 months ago. And just to prove that my hair can look passable just washed & conditioned with UNITE, this is it dried naturally, with a spritz of UNITE Tricky Lite (50% Wax, 50% Hairspray for definition & hold) applied when almost dry and hand scrunched around the front. It’s more of a casual, beachy look, but to me it’s pretty amazing that I can get it to look reasonably presentable without blow drying it at all! Are you a Babyliss Big Hair or UNITE fan? I know that what works for one may not work for another, but this combination definitely works for me! 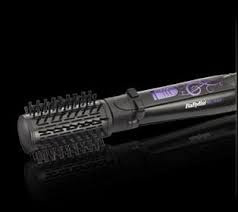 Babyliss Big Hair RRP £45 – I got mine at www.argos.co.uk but Amazon and John Lewis are currently selling for £39.95 with free delivery. YOUR HAIR IS STUNNING!! SO VERY GLAMOROUS!! I wish I had hair like ths! Thanks for all your lovely comments girls and lol liloo! Gawd I wish I had your hair and haircolor, I am totally jealous! Wishing you had Beyonce’s curls? Pining for Pippa Middleton’s sleek locks? Or simply trying to keep those pesky frazzled fly-aways under control? Whatever your hair wish this summer, the world’s leading brand in hair care appliances, BaByliss, is on hand to ensure you look as fabulous on the way to work as you do en route to the latest exclusive UAE party. This amazing BaByliss hair care kit includes the BeLiss drying, straightening and rotating hairbrush, the Pro180 curling tong and the ‘Liss & Go travel straighteners. Whatever your locks looks like when you wake, by the time you leave the house you’re guaranteed to have A-list hair!